“Abu Mohammed B.” is an ISIS propagandist operating on Twitter. He makes relentless calls for hijrah (migration) to ISIS-held territory, frequently tweeting messages like, “Who makes hijrah for Allah swt he will be forgiven all sins!!! What r u waiting, that death come to u there?,”Abu Mohammed B., Twitter post, November 4, 2015, 10:42 a.m., https://twitter.com/hijrah_jihad/status/661931478583025664. and, “Oh brother oh sister ur eemaan [faith] will not be complete befor u make #hijrah.”Abu Mohammed B., Twitter post, November 4, 2015, 1:35 p.m.., https://twitter.com/hijrah_jihad/status/661975151957958656. He also advocates for (presumably violent) jihad. 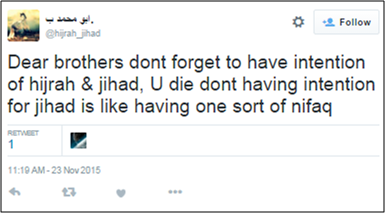 He has asserted that dying without the intention for jihad is nifaq, or hypocrisy.Abu Mohammed B., Twitter post, November 23, 2015, 11:19 a.m., https://twitter.com/hijrah_jihad/status/668826270885629952. Abu Mohammed B. claims to live in the “Caliphate” (i.e. ISIS-held territory), although this is not confirmed. It is also not yet clear where Abu Mohammed B. comes from, if he is not still in his home country. Abu Mohammed B. writes primarily in English, although he occasionally includes phrases in Arabic. 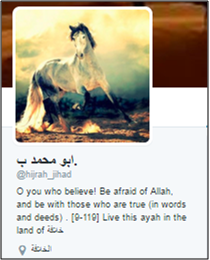 He frequently posts between 10:30 a.m. EST and 1:30 p.m. EST which, if Abu Mohammed B. were in Syria, would be 5:30-8:30 p.m.
@hijrah_jihadAbu Mohammed B., Twitter, accessed December 2, 2015, https://twitter.com/hijrah_jihad. “Abu Mohammed B.” is an ISIS propagandist operating on Twitter. “Whats with u o muslim? Why dont u make hijrah? Why u sitting in darul-kufr? Arent u afraid of Allah? Dont u want forgivness from Allah swt?” (Tweet)Abu Mohammed B., Twitter post, November 4, 2015, 10:39 a.m., https://twitter.com/hijrah_jihad/status/661930756336427008. 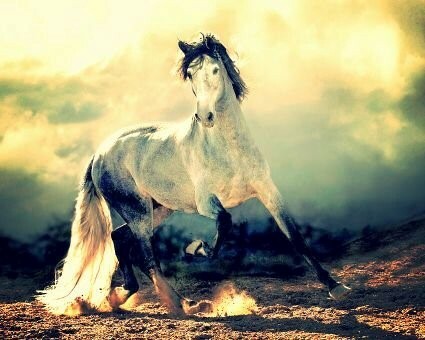 “Dear brothers dont forget to have intention of hijrah & jihad, U die dont having intention for jihad is like having one sort of nifaq” (Tweet)Abu Mohammed B., Twitter post, November 23, 2015, 11:19 a.m., https://twitter.com/hijrah_jihad/status/668826270885629952. “[D]on[’]t allow shaytan to give u false hope in this dunya life, he dont want u to make hijrah, he knows that u will be forgiven ur sins.” (Tweet)Abu Mohammed B., Twitter post, November 4, 2015, 10:47 a.m.., https://twitter.com/hijrah_jihad/status/661932715617476608. “Who makes hijrah for Allah swt he will be forgiven all sins!!! What r u waiting, that death come to u there?” (Tweet)Abu Mohammed B., Twitter post, November 4, 2015, 10:42 a.m., https://twitter.com/hijrah_jihad/status/661931478583025664. “Oh brother oh sister ur eemaan will not be complete befor u make #hijrah.” (Tweet). Abu Mohammed B., Twitter post, November 4, 2015, 1:35 p.m.., https://twitter.com/hijrah_jihad/status/661975151957958656.